WASHINGTON - Facing a divided Congress for the first time, President Donald Trump on Tuesday called on Washington to reject “the politics of revenge, resistance and retribution.” He warned emboldened Democrats that “ridiculous partisan investigations” into his administration and businesses could hamper a surging American economy. 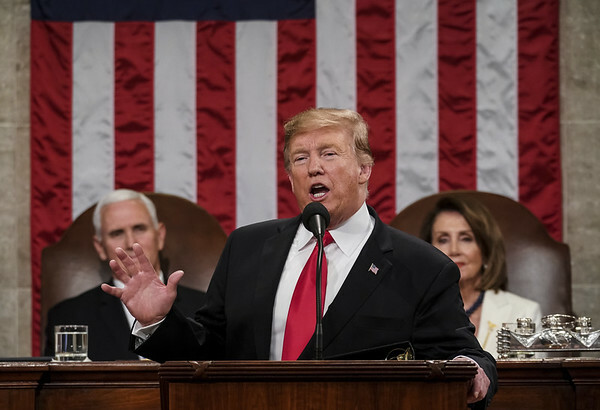 Trump’s appeals for bipartisanship in his State of the Union address clashed with the rancorous atmosphere he has helped cultivate in the nation’s capital - as well as the desire of most Democrats to block his agenda during his next two years in office. Their opposition was on vivid display as Democratic congresswomen in the audience formed a sea of white in a nod to early 20th-century suffragettes. Posted in New Britain Herald, , General News, Nation-World on Tuesday, 5 February 2019 22:46. Updated: Tuesday, 5 February 2019 22:48.